Department of Primary Industries, Water and Environment, Hobart, Tasmania. With a population of less than 20 in the wild, the Orange-bellied Parrot (Neophema chrysogaster) is one of the rarest birds on earth, due to loss of its overwintering habitat and competition with other species. 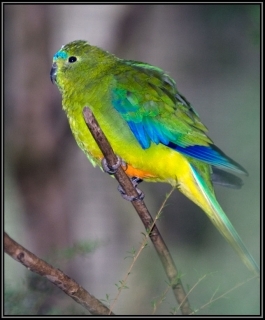 Outcomes: A recovery team for the Orange-bellied Parrot was first established in 1980. The wild population, which was estimated to number around 150 individuals in 2005, has since undergone a rapid decline. Individuals are being bred in captive breeding programs in Taroona, Tasmania, Healesville Sanctuary, Adelaide Zoo, Melbourne Zoo, Halls Gap Zoo (previously), Moonlit Sanctuary, Hobart Wildlife Centre in Tasmania, and Priam Parrot Breeding Centre. The captive population totals about 340 birds. Because of the precipitous decline in the wild population, an additional 21 birds from the wild population were captured in 2011 to provide genetic diversity in the species' captive breeding program. At Healesville Sanctuary, over 40 eggs had hatched by January 2017. Wild population: Less than 20, with about 340 held in captive breeding programme. Where found: Tasmania and coastal SE mainland Australia. History: This species is believed to breed only at Melaleuca and Birch's Inlet (historically) in south-western Tasmania, Australia (C. Tzaros and M.A. Weston in litt. 2003). After breeding, birds migrate to the mainland, stopping at King Island. They then overwinter at sites scattered from south-eastern South Australia to south-eastern New South Wales (C. Tzaros and M.A. Weston in litt. 2003). Annual winter counts in Victoria, South Australia and Bass Strait in the years from 1979 to 1990 varied between 67 and 122, not changing significantly. Numbers from the mainland have since declined. In early 2017 it was reported that sixteen captive birds had succumbed to Pseudomonas aeruginosa infection at Hobart Wildlife Centre. In early 2017 fewer than 20 birds were found at Melaleuca with no birds elsewhere. Extinction in the wild has been predicted to take place within 3-5 years (Sims 2010). Ecology: Breeding areas include temperate forest and moorland plains; wintering areas are mostly saltmarsh and pastureland with freshwater sources and roosting sites. Birds feed mainly on seeds and are seen in flocks, usually with a sentinel to warn the group of predators. In breeding areas birds roost communally in dense Melaleuca stands; individuals are sometimes seen in rural paddocks and around livestock.